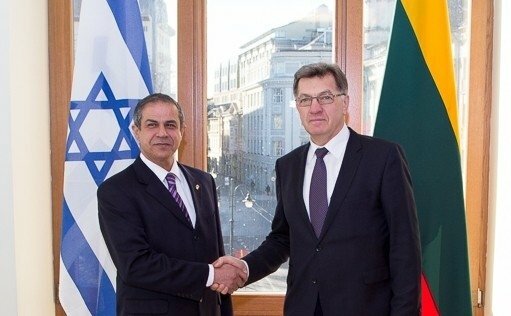 Lithuanian Prime Minister Algirdas Butkevičius met with incoming Israeli Ambassador to Lithuania Amir Maimon on Tuesday and said he hoped for cultural exchanges between the two nations. "The opening of the Israeli Embassy in Vilnius is a historic moment. I do believe that this set will not only strengthen interstate relations but will also promote cultural exchange between the peoples," the prime minister said. During the meeting, Butkevičius congratulated the ambassador on his appointment, and they discussed prospects of further cooperation, the Lithuanian government said in a statement. The prime minister also noted that Lithuania paid particular attention to commemorating Holocaust victims, promoting Holocaust education and tolerance as well as fighting anti-Semitism. Maimon is the first Israeli ambassador residing in Vilnius. He arrived in Lithuania in late January. The official opening of the Israeli Embassy in Vilnius is planned on 12 March.